These comics are amazing. I love the quality of the drawings! (Each individual panel make me jealous of your artistic skill.) Great job! 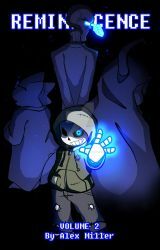 Yours is one of the best (if not the best) Undertale comics I've read. Thanks for the great content! good afternoon. an apology , I can use your comic for a translation in Spanish ? I would appreciate enough. I leave and I hope and are well. First things first: I fully understand that it probably takes you a while to make these Reminiscence comics, but holy, flipping, goodness!!! This stuff is amazing! You just want more And MoRe AND MORE!!!!!! Again I understand that it probably takes you a while to make these comics. MY MIND CAN'T PROCESS THIS AWESOMENESS!! Sir, you have earned yourself another watcher! Awesome work, especially in Reminiscence! THE COLOURS. MY EYES ARE BEING FED.